MS Word provide an important facility to set your label in the bottom area of any selected image, graph, table etc. There are two ways to easily insert any caption or any label either automatically or manually in active document on selected object command from the inserting or adding caption option from Reference Tab. This feature is used to add or set a label or caption to any selected picture or image for setting relevant information to clarify the object. It is a line of text that appears below or top of the selected picture or image. You can add any label to selected table, image, equations, or other objects in active document of MS Word. You can easily inserting or adding Caption by this guide. 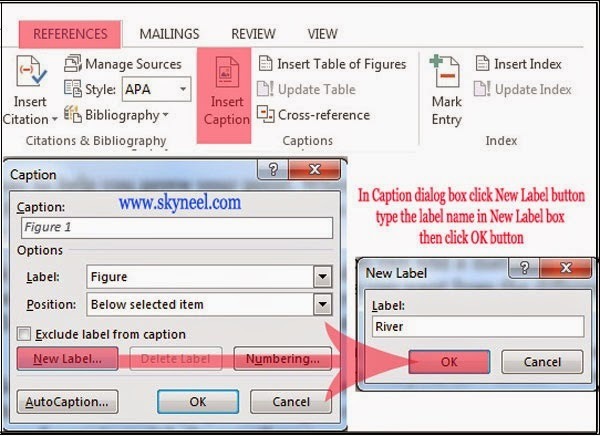 You have to take following few steps to easily inserting caption on selected object in active document of MS Word. Step 1: Open an existing document or you can also create a new document in which you want to set label or caption. Insert any object like any picture /image, graph, SmartArt, Shape, and Table etc. from the Insert Tab. Step 2: Now, select the object on which you want to set label or caption. Set the alignment of selected object either from shortcut key like Ctrl +E or use Home tab. Step 3: Click on the Reference Tab >>> Then, Click on the Insert Caption command >>> Click New Label button >>> Type the name of label which you want to set like Photo, Table, Graph etc. then click OK button. Select Below the selected item in Position then click OK. If you want to insert caption or label automatically in MS Word. You are able to automatically insert any caption during adding any graphic, any table and any other objects in the active document. You can set which objects are captioned automatically, set position and numbering. This can be done by clicking Insert Caption option from Reference Tab >>> Click AutoCaption option >>> Add one or more options when you want to insert caption >>> Click OK button. I hope you like this inserting or adding Caption installation guide from which you will be able to easily inserting or adding Caption without any extra efforts. If feel any problem in this guide then please use comment box. Thanks to all.